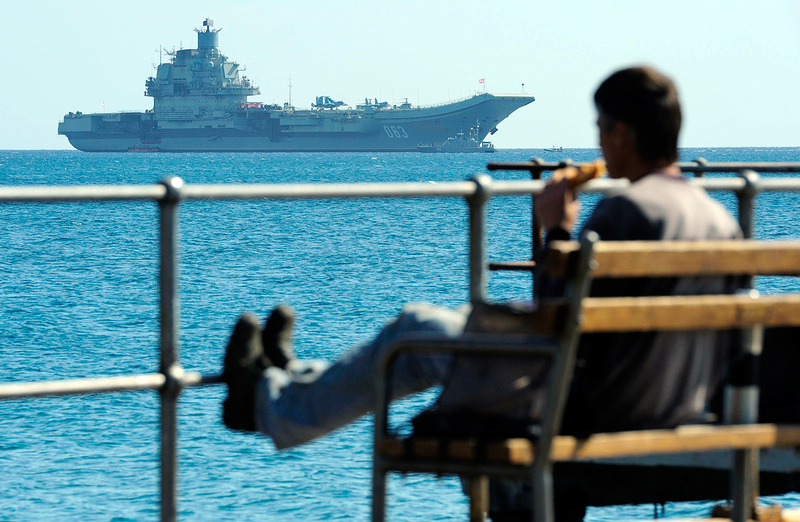 A man enjoy the sea and the sun as in the background the Russian aircraft carrier Admiral Kuznetsov lies at anchor off Cyprus’ largest port of Limassol. The Pytlivyi patrol ship of the Russian Black Sea Fleet has returned to the Sevastopol port from a voyage carried out by the Russian Navy’s Mediterranean Squadron, Fleet Spokesman Vyacheslav Trukhachev said on Nov. 28. "The Pytlivyi under the command of Captain 2nd rank Dmitry Dobrynin left Sevastopol on May 25 and joined the Russian Permanent Task Force in the Mediterranean the next day as part of a planned rotation," Trukhachev stated. Russia has deployed a permanent naval task force in the Mediterranean. On Nov. 15, Russian Defense Minister Sergei Shoigu informed Russian President Vladimir Putin of air strikes that had pounded terrorists in the Syrian provinces of Idlib and Homs. The Admiral Kuznetsov, Russia’s only aircraft carrier, which is taking part in military hostilities for the first time, was involved in the operation.